Often when we conduct postal history research we find a resource within a resource that we didn’t expect to find at first glance. Such is the case with our U.S. Stamp files. Housed in the second floor Archives area of the American Philatelic Research Library (APRL), the U.S. Stamps files archive is a collection of file folders each of which may include articles, press releases, stamp announcements, photos, serviced covers, photo essays, news clippings and other research items. The folders are arranged and labeled by U.S. Scott number and are an invaluable resource for researchers and library staff for either beginning or supplementing research regarding a particular U.S. stamp issue. Not all of the folders contain the aforementioned items, but one of the items that many of the folders do contain (or now most will contain with the generous assistance and donations offered by In-Kind Donation Coordinator Richard Nakles) are first day ceremony programs. For those that regularly attend first day ceremonies or are less frequent attendees, show programs produced by either the U.S. Postal Service or in some cases by sponsors of the issuance event are routinely given away for free at most of these events and in time have now become quite collectible in their own right. The programs are prized by collectors, but in terms of the APRL and its research collection, these same programs provide a wealth of useful information. With the first official show programs appearing with the Booker T. Washington issue, April 7, 1940, these one-of-a-kind philatelic items can be very simple or quite elaborate. 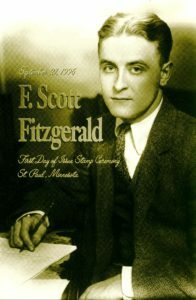 As these event programs eventually became a staple of these now more elaborate ceremonies, the information they provided also began to become more detailed as well, often including specific ceremony proceedings, attending dignitaries and speakers, stamp issuance background and data, stamp subject matter information and background, and with more recent programs many times including a serviced first day cover or a inserted cancellation. The research benefit of these programs is surprisingly plentiful. Many collectors and researchers of particular U.S. stamp issues welcome the information provided about the event (i.e. attendees, dignitaries, proceedings, place and time of event, issuance/design history, etc.) as the programs provide a more complete record of the stamp’s issuance and history. 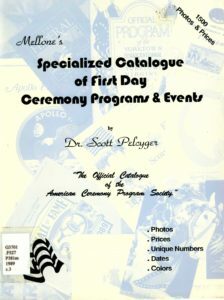 Inevitably these programs became so popular as collectibles that in 1989 Mellone’s produced a catalogue for them titled Mellone’s Specialized Catalogue of First Day Ceremony Programs & Events by Dr. Scott Pelcyger (G3701 .F527 P381m 1989). Unfortunately updated editions of the catalogue were never published. If you are interested in researching a particular U.S. stamp or specifically its first day ceremony, these programs are an excellent starting point for your research. Contact the APRL at either (814) 933-3803 ext. 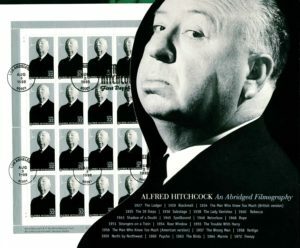 240 or library@stamps.org to see what ceremony programs may be available in the U.S Stamp files for the stamps you collect for further research.